The official website of the now XXXHOLiC Rou OAD has a new look to promote the release of the OAD which will come out on March 9 with the limited first edition of XXXHOLiC #19. The OAD will be entitled XXXHOLiC・Rou Adayume (“Adayume” is also the name of the OAD theme song performed by Suga Shikao). As usual, the OAD script will be written by CLAMP’s Nanase Ohkawa. The DVD cover will feature a new illustration drawn by CLAMP. The staff is the same as the previous OADs and the seiyuus of Yuuko and Himawari are amongst the cast members. If you missed it, the OAD opening movie was released previously as a campaign gift. Check it out here. Lastly, pictures of the second XXXHOLiC TV Anime series DVD Box are available at XXXHOLiC-NET. The release is scheduled for October 27. You think? 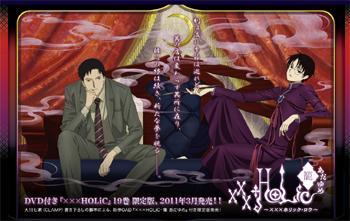 Wow I really like it and I think it has a XXXHOLiC vibe to it. I had listened to it way before this and it never really caught my attention, but I changed my mind about it ever since I saw the OP sequence. Maybe they will add her name later…. XXXHolic 19 is rumoured to be the last volume? Where did you hear that? and i’ve found that i acually like his live verson of the song better. i cant wait for the next OAD!